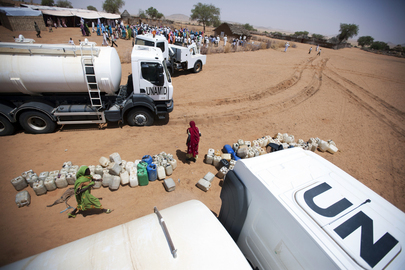 Water is distributed in El Srief (North Darfur) where the nearest water point is 15 kilometres away. The activity fosters Disarmament, Demobilization and Reintegration (DDR). The outreach activity is organized by the African Union – United Nations Hybrid Operation in Darfur (UNAMID) and supported by the United Nations Development Programme (UNDP), the United Nations Children's Fund (UNICEF), the North Sudan DDR Commission and the local NGO Friends of Peace and Development Organization (FPDO).